Saint Joseph’s Day is a communal holiday. In addition to the altars created, which are an exhibition of abundance and a dialogue with God, local specialties are prepared and shared with members of the community, more specifically with hungry and poor citizens of the town. In addition to macco (the fava bean soup I wrote about the other day) pasta with sardines, fennel, and sultans (pasta con le sarde, pictured from Buatta restaurant in Palermo) is served. 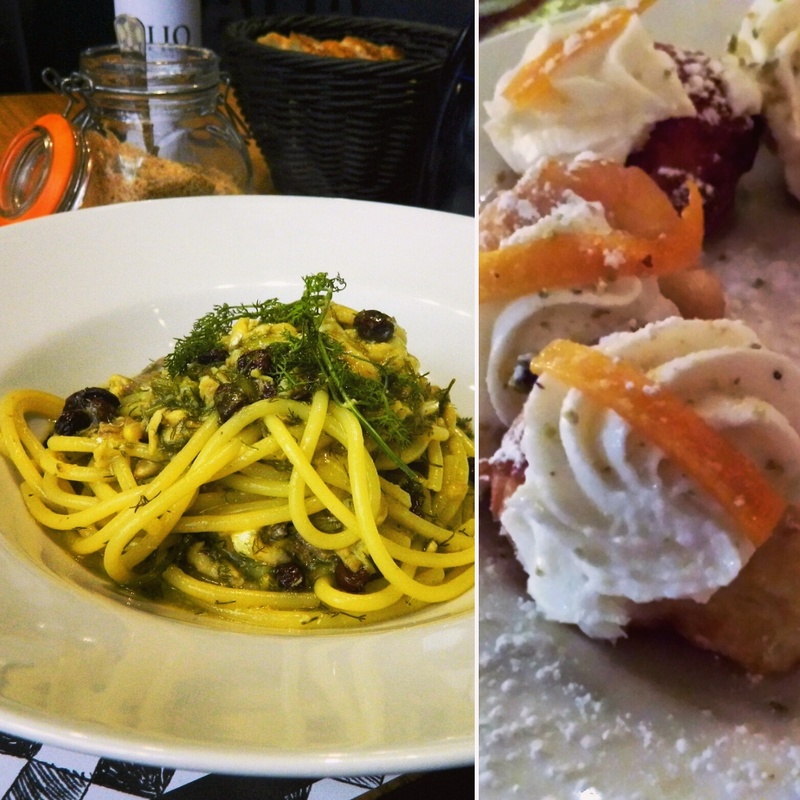 And then there is everyone’s favorite–the sweet sfince di San Giuseppe (pictured at right, from Cacio e Vino in New York). Sfinci are fried cream puffs served hot with a dusting of cinnamon, confectioner’s sugar, and honey, or served cold and open-faced with a smear of ricotta cream and decorated with candied orange. Depending on the town, sfinci may have a different appearance and different ingredients. In Naples, for example, they even have a different name: zeppole. In Rome, they are called Bignè di San Giuseppe. In summary, St. Joseph’s Day is a heartwarming holiday celebrating spring’s awakening and fertility. It’s a feast to give thanksgiving for our gifts and to recognize how we can help others less fortunate. NB We’ll have both dishes tomorrow at Cacio e Vino in New York City for our feast.